Four Tacoma Power Parks are available to you and your family for camping, boating, fishing, water skiing, nature watching and day use. 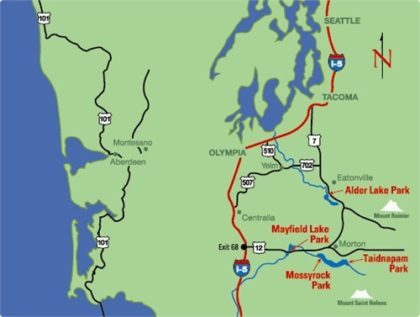 All our parks are located in western Washington on the shores of lakes formed by our hydroelectric dams, which generate clean, renewable electricity. To reserve individual campsites, group camps or kitchen shelters at our parks, use our online system or call 833-290-8180. Our reservation system is for Tacoma Power Parks only and is not part of Washington State Parks. You may reserve campsites nine months in advance for dates between May 15 and Sept. 15. The rest of the year, campsites are available on a first-come, first-served basis (except Mayfield Lake Park). Campground check-in begins at 2:30 p.m. Check out is 1 p.m.
Day-use visitors may use the boat launches and picnic areas between 8 a.m. and dusk. See the Department of Natural Resources and respective county websites for burn ban details by county. Alder Lake Park is in Pierce County; Mossyrock, Taidnapam and Mayfield Lake parks are in Lewis County. Learn more about reservations and fees at our parks. For information about boat launches, river flows and lake levels call (888) 502-8690. For other information, please contact us at tacomapowerparks@cityoftacoma.org.